We are pleased to announce Matt Copson and Alastair MacKinven Reading Community Outreach Mural Workshop, a new temporary public artwork made in collaboration with the local community. 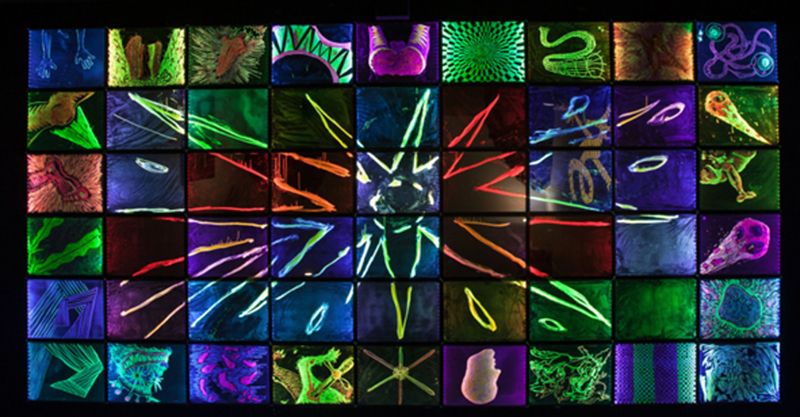 Painted onto the tenth floor windows of Thames Tower, a regenerated office tower block in central Reading, this stunning outward facing glow-in-the-dark mural can be seen for two miles and combines the untapped creative energies of local youths. Copson and MacKinven’s frieze-like ‘extravaganza’ is an explosion of energy that attempts to create a conversation about art in the town, in part by combining the iconoclasm of the 1990s London art group BANK with the radical political subject matter of Eddie Peake.